हमारे नौनिहालों किशोर किशोरियों (छः से सत्रह साला )के लिए भी ये लाज़िम है वांछित है रोज़ाना एक घंटा बाहर की तेज़ रफ़्तार गतिविधियों में बिताएं। खेल- कूद, रस्सा - कूद जैसा कुछ भी जो भावे सो करे। अलावा इसके सप्ताह में कमसे कम दो मर्तबा पेशियों को मज़बूत बनाने वाले खेलों इतर गतिविधियों में शिरकत करें . आज की स्थिति यह है ,इन सिफारिशों पर ले देकर २६ फीसद मर्द ,१९ फीसद औरतें तथा कुल २० फीसद बालिग़ (व्यस्क ,एडल्ट )ही खरे उतर रहे हैं। इससे १० फीसद प्री -मच्योर डेथ के मामले बढे हैं स्वास्थ्य बजट पर ११७ डॉलर का भार पड़ा है। (अमरीकी स्वास्थ्य सेवाओं के सर्वे के मुताबिक़ ). (CNN) If you're sitting down while reading this, stand up. Guidelines released Monday by the federal government show that most Americans are not getting the exercise they need, costing the health care system over $100 billion each year. The new standards are similar to those released 10 years ago, but the government is scrapping a recommendation that physical activity occur in 10-minute blocks, instead telling Americans to "move more and sit less" whenever possible. Any amount of exercise has some health benefits, officials say, and some benefits are even immediate, like better quality of sleep or reduced anxiety. "The new guidelines demonstrate that, based on the best science, everyone can dramatically improve their health just by moving -- anytime, anywhere, and by any means that gets you active," said Dr. Brett P. Giroir, assistant secretary for health at the Department of Health and Human Services. The guidelines recommend an hour of "moderate-to-vigorous" activity each day for children 6 to 17, along with muscle-strengthening activities two days a week, like climbing on playground equipment or playing basketball. For the first time, the guidelines also recommend that preschool-age children have at least three hours of "active play" each day. For older children and adults, moderate-to-vigorous activity can include brisk walking, running or "anything that makes the heart beat faster," and adults should aim for about 2½ hours each week. But just 26% of men, 19% of women and 20% of adolescents are meeting the standards, officials said, costing the US health care system $117 billion each year and leading to about 10% of premature deaths. The findings were published Monday in the Journal of the American Medical Association. "When we move more, we have better cardiovascular health, we are stronger and less susceptible to disease, and we feel better," Giroir said. "Physical activity can help manage chronic conditions that many Americans already have." Based on new evidence, the updated guidelines say exercise can reduce symptoms of anxiety, slow the progression of hypertension and Type 2 diabetes, and help prevent eight types of cancer in adults. Exercise can also improve cognition in those with attention-deficit hyperactivity disorder or dementia, the guidelines say, and even reduce the risk of Alzheimer's disease. "These guidelines are fairly clear that there's strong evidence that physical activity reduces a person's risk for developing dementia," said Keith Fargo, director of scientific programs and outreach at the Alzheimer's Association. The group, which was not involved in crafting the guidelines, says that exercise isn't a cure for Alzheimer's, but it notes that physical activity and other lifestyle changes can reduce the risk of cognitive decline. "That's something you can do right now, today," Fargo said, "People can begin to take their risk for dementia into their own hands." 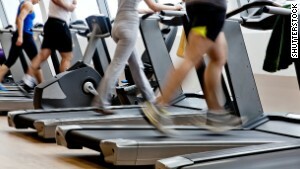 The American Heart Association announced Monday that it would adopt the government's exercise standards. "We urge other health groups and interested parties across the country to adopt the guidelines and join us in committing to help ensure more people get moving," said Dr. Ivor Benjamin, the group's president, adding that exercise can "help people live longer, healthier lives for themselves, their families and their communities."